The explosion of epic fantasy we are experiencing in 2013 was not even a blip on the market radar in the 1980s. A handful of British writers had written a few tomes in the first half of the 20th century—E.R. Eddison, C.S. Lewis, and of course J.R.R. Tolkien, and in turn were imitat—err, followed by a few American writers, Donaldson, Brooks, and others. But the veritable deluge currently ongoing was not even a twinkle in papa epic’s eye. At the beginning of the decade, a couple of names set out to re-define the term ‘epic’, going on to have market impact to this day: Robert Jordan, Glen Cook, and Terry Pratchett. The first choose to wallow in the archetypes of the genre to the point his series became bogged down by its own weight. The second choose to ignore good and evil and go in a grittier direction. And the third, well, the third chose another road: humorous subversion, and in turn has kept fantasy fresh and funny ever since. 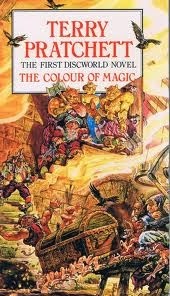 Monty Python’s fork in the road was 1983's The Colour of Magic; Pratchett hasn’t looked back since. The Colour of Magic is a parody of absurd proportions. Starting in Ankh-Morpork, a rough-and-tumble city of medieval presentiments, the book tells the story of Rincewind, a wizard kicked out of Unseen University after learning only one spell. Running into a man at a bar, Twoflower (a naïve tourist from rich foreign lands), the two find themselves stumbling and bumbling their way from one unwanted adventure to another, trying to stay alive while keeping possession of the one thing everybody wants: a walking chest of gold. Yes, you read the last phrase correctly. Made of sentient pearwood, the chest ends up protecting the pair more often than needing protection. The thieves of Ankh-Morpork, the dragons of Netherlands, and the wizards of the Big Sea all wanting a piece, The Colour of Magic is a romp. It’s interesting that The Empire Strikes Back is considered by most to be the best Star Wars film of them all. Is it the love-triangle between Leia, Luke, and Han Solo? Luke’s time with Yoda? The emergence of Boba Fett? Or is it that the Empire wins in the end? Regardless, what can’t hurt are the sensawunda set pieces. The asteroid hideout with a surprise, the battle over the ice plains of Hoth, training in the jungles of Dagobah, the requisite time aboard star destroyers, and of course, the stunning scenes in the climactic sequence at Cloud City. 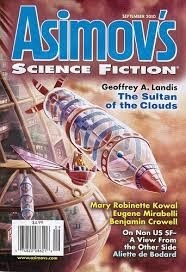 Following in the footsteps of George Lucas’ mode of sci-fi, and seeming particularly entranced with idea of Cloud City, Geoffrey Landis’ 2010 novella The Sultan of the Clouds is mini-space opera of wholly retro proportion. The Sultan of the Clouds is the story of David Tinkerman. A technician living on Mars, he is asked to go to Venus with the lovely and intelligent Dr Leah Hamakawa. Invited by the planet’s magnate, the 12 year old Carlos Fernando Nordwald-Gruenbaum, Tinkerman doesn’t know what to make of the invitation but accompanies the woman he secretly loves, anyway. Arriving at the ruler’s lavish domain in the cloud cities of Venus, things quickly turn mysterious. For reasons Tinkerman cannot comprehend, Norwald-Gruenbaum seems sets on courting and marrying Dr. Hamakawa regardless of the age difference. Tinkerman’s presence extraneous as the magnate pours traditional Venutian gifts on the Doctor, he has plenty of time to explore the magnificent floating globes and transport systems, and in the process gets himself into more trouble than he imagined. The beautiful yet toxic atmosphere of Venus threatening, it’s only a matter of time before he comes to the bottom of Norwald-Gruenbaum’s ambitions. Dune the hero’s tale; Dune Messiah the deconstruction of the hero; Children of Dune the emergence of a new hero and society; and GodEmperor of Dune reflection on the story thus far, Heretics of Dune describes what happened in the Duniverse after the fall of Leto II. The most operatic of the series to date, plot complexity is ratcheted up numerous degrees as the saga expands. New groups, new viewpoints, and a new set of characters (with extremely familiar pasts) crop up to tell a tale that extends the Dune storyline and increases the scope of the first four novel. 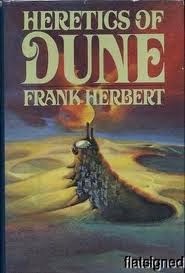 Given God Emperor of Dune was a point at which Herbert could have finished, choosing to continue the series inevitably entails doing precisely so. Heretics of Dune opens on Chapterhouse, the home planet of the Bene Gesserit. Having survived and developed in the 1,500 years that have passed since Leto II was assassinated, the sisterhood have been most responsible for keeping humanity on the Golden Path, and at the beginning of the story are training the latest Duncan Idaho ghola. Another gift, the Tleilaxu Master of Masters Waff has planted the ghola as part of contrived assault on humanity with the ambition of wiping them from the universe. Complicating his intentions, however, are the Honored Matres, a society of women who developed in secret in the aftermath of Leto II. Intentions yet to be revealed to the universe, their appearance from the depths of space is topped by the emergence of a young woman named Sheanna on Arrakis (now called Rakis) with the ability to control sandworms. The Bene Gesserit sending one of their most experienced sisters to investigate, the novel’s gears begin turning in the aftermath, protection of Sheeana anything but certain with the existence of the all powerful spice. Ian R. Macleod’s 1998 The Summer Isles is the story of an aging homosexual man caught up in the politics of his time. Though set in the time between the world wars, there remains a lot about the novella the reader will not recognize. A work of alternate history commenting upon early- to mid-20th century British politics, the narrowness of the aim is more than made up for by Macleod’s quality prose, characters, and method. At the outset of The Summer Isles, Griffin Brooke is drowning in self-pity. Hope for a meaningful relationship long lost, he takes a much bigger hit when told by his physician that terminal lung cancer will end his life much sooner than expected. 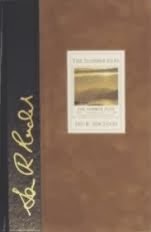 The reader is thereafter tossed on the rapids of Brooke’s formative youth, the book he is thinking of writing, days with his first love, early professions, his present life as a professor at Oxford, his despair, as well as professional connections. Turbulent so say the least, the prognosis soon leads him to think of doing something rash. Fate intervening, Britain’s political situation takes on a new light. In his classically styled epic fantasy novel The Worm Ouroboros, E.R. Eddison plucked a man from our Earth and deposited him on a Mercury where the kingdoms of Witches and the Demons were preparing for war. The war occurred, but like the titular creature, the end of the novel features a reversion to the beginning, the conflict starting anew. 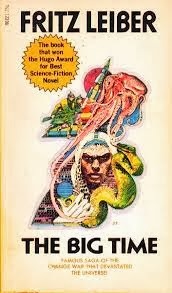 Utilizing a similar idea (the recursive nature of man’s conflicts) but framing it in wholly different form, Fritz Leiber’s 1958 The Big Time sets its story against the backdrop of real history, incorporates future history, and proceeds to comment in theatrical fashion upon human behavior. The language and word play brilliant, the short novel (in fact a novella) is a timeless gem of science fiction and worth a read for anyone interested in the literary side of the genre. The Big Time is told by an Entertainer named Greta Forzane. Residing in the Place, an R&R/infirmary located outside of time where Spiders fighting in the great Change War come to relax, Greta is responsible for helping soldiers recuperate while they take a break from their eternal fight against the Snakes. The soldiers drawn from all eras and cultures, in the opening pages three come in from the Void needing a break from the action: a Roman legionnaire named Mark, a Nazi SS named Erich, and a 17 th century British jack-of-all trades named Bruce. After a brief fight in which one injures another, they eventually settle down and begin to discuss the war at large, how the Snakes are altering history to affect the future, and the miserable state of the Spiders’ defense. But soon enough three additional soldiers come in from the fighting, and carried with them is a locked box. The content a ticking atomic bomb, the Change War gets forgotten as those in the Place try to find a way to defuse or dispose of the deadly object. The 1980s were a time of significant political and social upheaval in China. Mao Zedong dying in the late 70s, early years in the decade saw ideas that had been biding their time appear in the mindset of what was still a very totalitarian government but a government seeking to escape the stagnation of the regime spearheaded by Mao. Putting too much air into the balloon initially, the 80s’ financial scene in the Middle Kingdom quickly burst, culminating in a collapse, and indirectly the Tiananmen Massacre of ’89. Learning some lessons, those in power throttled back their economic ambition and began putting in place more stable policies. Now, more than twenty years later, the economic and social development of China is undeniable. Regardless of its environmental or political impact (though this is not to be taken lightly), the quality of life is slowly improving for the average person (see the burgeoning middle class). 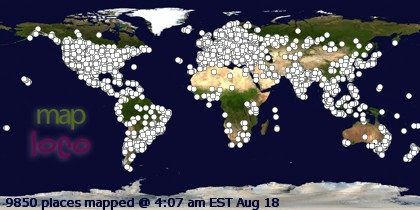 China now possessing the second largest GDP in the world, it is only the US looking over its shoulder, and given the pace with which the Chinese are gaining, there are many who believe it is only a matter of time before China overtakes and comes to dominate the economic world in a fashion similar to the US the past 50 years. Written in the aftermath of Tiananmen, Maureen McHugh’s 1992 China Mountain Zhang—on top of being able to overlook the economic collapse of China in the 80s—postulates a futuristic scenario wherein China comes to dominate the US culturally and economically. The focus human and the writing subtle, it is more than just social commentary, however, making for an excellent first novel. China Mountain Zhang is the story of Zhang Zhongshan—the Chinese equivalent of naming your son Abraham Lincoln Smith. An American Born Chinese (ABC), his Latino mother and Chinese father, on top of giving him the patriotic name, paid to have his genes altered so that he would appear full-blood Chinese, thus giving him a leg up on other Americans in the Chinese-dominated US. A construction tech living in New York City, Zhang spends his days on site performing manual labor for a Chinese boss and his evenings partying with friends and going to the kite races. But when a clash of cultural proportions occurs, Zhang is forced from his job and must reevaluate the direction of his life. Traveling through highly unexpected locations, he ultimately finds a place, just not where he imagined. The name Patagonia conjures up a lot of images in people’s minds, even for those who have never been there. Mountains, deserts, wildlife, and wiiiiiide open spaces, there is a strong sense of isolation, and as a result freedom, inherent to the stretch of South America that connects the nether regions of the south to the more populated in the north. An extraterrestrial wild west, I loved our time there. From the first class asados to the wine, Pampa desert to the people—even the lonely town of Perito Moreno was a nice place to spend time. Caveat: a place to be experienced in person rather than vicariously through photos, I will be unable to convey the feeling of actually being in Patagonia with what follows. Recommend you go yourself. Our time in Argentina began with Bernard O’Higgins National Park. Home to innumerable peaks, lakes, glaciers, and the southern ice field, it surely is one of the most beautiful places in the whole world. The Perito Moreno glacier (above) is just one corner. Our last four days in Chile were spent in the world renowned national park Torres del Paine. This reputation pans out in two directions: it is a place filled with stunning natural wonder, but like America’s Yellowstone, is also filled with tourists. A significant change from our time in Dientes del Navarino, the natural beauty was, however, more than enough to make the trip worth the while. We asked this Guanaco on the outskirts of Torres del Paine to hold his head at a proper, National Geographic angle while we took a photo. He was all too happy to oblige. With the quality of special effects improved exponentially, the blockbuster disaster movie appeared in the 90s and hasn’t looked back. Tornadoes (Twister), meteors (Deep Impact and Armageddon), seismic activity (The Core), volcanoes (Dante’s Peak), massive weather events (The Perfect Storm), and, who can forget, Sharknado, have in one way or another tried to capitalize on the potential power of nature to earn a dollar. Opening with a reasonably plausible scientific premise (except in the case of the latter, of course), then quickly cutting to the melodrama and special effects, these films have done nothing to make people aware of the physical laws governing the actualities of our world and the true potential for catastrophe. In writing the Science in the Capitol trilogy, Kim Stanley Robinson aimed to correct that imbalance. The most realistic look at the intersection of environmentalism and politics the genre has yet produced, Forty Signs of Rain, the first book in the trilogy, is an important book that, while perhaps not possessing the flare many people stereotype sci-fi as having, nevertheless frames the American political situation in a fashion extremely relevant to the modern world and the toll humans are slowly taking on it. Forty Signs of Rain centers on the lives of two men: Frank Vanderwal, a microbiologist, and Charlie Quibler, house husband and environmental policy advisor, both living in Washington DC. At the outset of the story, Frank is winding down his year at the National Science Foundation and preparing himself to return to the research organization where he is employed in San Diego. A group of Buddhist delegates from the country Khembalung, a ficitonal waterlogged island off the coast of Kolkota, have recently rented office space in the first floor of their building, and through his colleague Anna Quibler (Charlie’s wife), are introduced. Khembalung drowning as the waters of the ocean rise higher and higher each year, the delegates have come to Washington to plead their case and get assistance for their people, both financially and in political terms that will see a change in global environmental practices. Charlie, though spending most of his time caring for his two year old son Joe, is able to squeeze in negotiations and bill writing for the most environmentally supportive politician, Senator Phil Chase. Charlie frustrated with the cuts and elisions to the bills he proposes, and Frank frustrated with the NSF’s inability to enact real change, by the end of the novel both get what they want, but have something else, something major in common to complain about. Ever since reading Charles Darwin’s The Voyage of the Beagle, it has been a dream to visit Tierra del Fuego. After years of hoping, this year I finally had the chance. I was disappointed by the fact I couldn’t stay longer. I’ll start the photos of my trip (which included Chilean and Argentinian Patagonia as well) with Dientes del Navarino and the Beagle Channel in Chilean Tierra del Fuego. Literally the end of the world (nuts to you Ushuaia), Navarino is possible to access only by boat or plane, no roads from Argentina or Chile yet to reach the remote island. We opted for pontoon, and above is a photo of us crossing the Beagle Channel from Argentina to Chile. Given the immense degree of similarity (the parallels simply too large to be ignored), it would seem Maureen McHugh’s 1996 novella The Cost to Be Wise is an open homage to Ursula Le Guin. Featuring an anthropologist entering a foreign environment, internal culture clashes, personal struggles within an alien society, and even one subtle but communicative piece of technology (not an ansible! 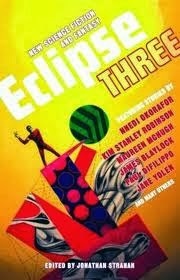 ), McHugh wields the elements of Le Guin’s fiction with aplomb, a quality story told in the process. The Cost to Be Wise is the tragic story of Janna, a teenager living in the primitive village Sckarline on a planet colonized by humanity so long in the past Earth is only now sending representatives to restore contact. On the opening page, an anthropology student named Veronique arrives at Sckarline to begin study for her graduate work. Possessing clothes and technology the people of Sckarline do not, there is likewise a language barrier; Janna stumbles along in broken English to introduce Veronique to her family, boyfriend, and the ways of the village and their distilleries. Veronique’s studies do not go as planned, however, in the whiskey drenched community. A band of outrunners from a nearby village suddenly appear and begin causing trouble by stealing liquor and livestock. Both young women’s eyes opened wide in the aftermath of the raid, nothing will ever be the same, the cost of wisdom truly dear. 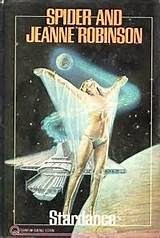 One of only a handful, Spider and Jeanne Robinson’s 1979 novella Stardance accomplished the rare feat of sweeping the major American science fiction awards. The quality of these awards contentious, the story appears to fit perfectly in the middle of the other novellas receiving such recognition. Founded on a strong, poignant premise and escalating into the goofily absurd, the story has something for all fans of science fiction, and as a result resides on the fence of quality. Stardance is the story of Charlie Armstead, a former dancer who was forced to become a cameraman after an accident left one of his legs permanently injured. A colleague introducing him to a new dancer named Chara one day, Armstead quickly dismisses the woman based on her size and build. Seeing Chara dance, however, ideas begin to form in his head of how he might be able to capitalize on her unique talent for both their benefit. Striking out together to attempt modern dance in a fashion never before presented, Armstead places his future in the hands of Chara and his camera work. Where the choice takes them is out of this world and into a venue never before having seen dance, and, a few other squiggly things. 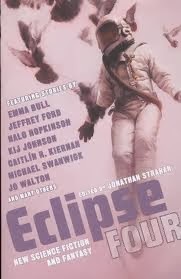 For those who have not been reading the Eclipse anthologies in order but are interested in Eclipse Four, the series can briefly be summed up as: Jonathan Strahan’s attempt to collect some of the best, most readable authors writing at the beginning of the 21st century in speculative fiction. 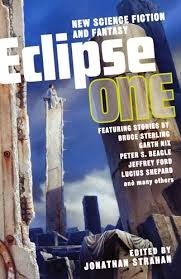 Eclipse One producing a wide variety of solid stories, Two leaning toward science fiction and Three toward fantasy, Strahan, according to the introduction, intended Four to be in the same vein as Three. The result, however, is an anthology more similar to One given the mix of styles, sub-genres, and gender representation. The following is a brief overview of the fourteen stories. “Slow as a Bullet” by Andy Duncan is a tall tale—or perhaps rather, a slow tale. A simple premise for a simple story, on a whim Cliffert bets his buddies that he can outrun a bullet. Dripping with Southern flavor, this one-off is an easy foot on which to start the anthology—pun intended. In the hands of any other writer, this perhaps may have been a dud, but with Duncan’s infusion of character—in the meta sense—the story leaves an impression. “The Pelican Bar” by Karen Joy Fowler is the story of Norah, a rebellious fifteen year old sent to a harsh rehabilitation home to mend her ways. A well written story that effortlessly progresses Norah’s story, it simultaneously holds the other shoe an inch off the floor, letting the reader wait for it to drop. And when it does, the science fiction conceit is revealed. While seeming incongruous from the overtones of realism developed to that point, the conclusion nevertheless serves as a symbolic representation of the innate differences between teenagers and adults. Perhaps better left as a work of realism, the corniness partially undermines what is a striking story to that point. All in all, a sharp point on which to open the anthology. “The Hero” by Karl Schroeder is an abstract note on which to open the anthology. The setting disassociating, it requires patience to see through the web of illusion Schroeder has spun using ordinary words like ‘bug’, ‘dragon’, and ‘capitol’ to represent things which are anything but ordinary in his imagined world. Japanese anime present in much of the imagery of this distinctly non-Earth sci-fi setting, the story is of Jessie and his plight to ‘save’ humanity in its multi-sun domain. Seeming to need a little more flesh for complete coherence, the story is nevertheless unique and sets the tone for the whole of what is to come. “Unique Chicken Goes in Reverse” by Andy Duncan – Father Leggett is called to the house of the O’Connors one day, and there meets their strange daughter Mary, and an even stranger chicken which she has named Jesus. Uncertainty and doubt creeping in regarding his faith in the aftermath of this encounter, the religious undertones of this subtle, wonderfully balanced story run deep. What reads as a goofy title is a significantly more multi-layered story. Oh, how I love a well-written negative review. 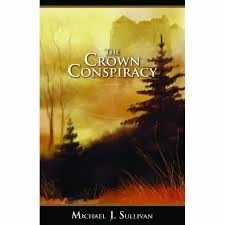 They beg to be tested, and encountering this review of Michael J. Sullivan’s debut novel The Crown Conspiracy on Strange Horizons, I had to go out and see for myself whether the critique was accurate. What I discovered is that while the attempt at archaic language is less of a trip-up, the book indeed cannot get beyond mediocre for ambition and content. Certainly ‘fun sword and sorcery adventure’ for some, it remains predictable, run-of-the-mill genre pulp that does not warrant investment for the reader looking for challenging or meaningful material. The Crown Conspiracy opens with the arrogant Duke Archibald preening over his good looks and the letters he holds in his hand. Having invited the magistrate of a neighboring land to his castle, he proceeds to blackmail the man, stating he holds correspondence of an unequivocal nature that the magistrate’s daughter is having an affair with a common man. When it is revealed that the letters are mysteriously void of words, the magistrate walks away smiling, leaving the Duke fuming. The scene switching to the daughter, the mystery of who switched letters from the Duke’s private safe is slowly revealed—as is a bucketload of adventure. In the days and months leading up to the invasion of Iraq in 2003, US media was full of news regarding the threat weapons of mass destruction posed in the hands of Saddam Hussein. Momentum building, the onslaught of news coverage, White House propaganda, and an internal agenda culminated in the US government voting to allow its military forces to invade the Middle Eastern country under the premise that those weapons, whose existence were a foregone conclusion, would eventually be used against political allies—if not the US itself—in the wake of 9-11. As history tells, no nuclear, chemical, or biological weapons were ever found, and yet the invasion had occurred. Nearly paralleling this storyline to a ‘T’, Terry Pratchett’s 1997 Jingo takes a right hand turn at the confrontation, making it extremely prescient—to a point, that is. That point is what makes the novel worthwhile—oh, that and the humor (wink). 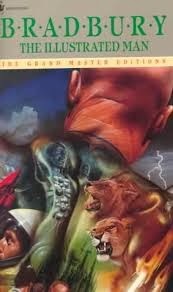 Another in the City Watch sub-series, Jingo is the twenty-third Discworld novel. Featuring Commander Vimes, Corporal Carrot, Detritus, Nobby, Lietenant Colon, Colonel Angua, Lord Vetinari, Leonard of Quirm, Lord Rust, and several other familiar names, the story tells of a dispute between the Ankh-Morporkians and their distant Arab-esque neighbors, the Klatchians. The dispute erupting when an island appears in the sea between the two nations, each side claims the rock as its own—appropriate insults appearing regarding who is and isn’t de facto owner. With an important visit by a Klatchian emissary due, none other than Prince Khufurah, Vimes has his squad on high alert to make sure nothing untoward happens during the visit, inlcuding the scheduled parade. But try as hard as he likes, trouble does come, and in its wake, war and rumors of war. But as to the actual showdown between Ankh-Morpork and Klatch itself, well, the reader will have to discover that for themselves to see how it parallels reality. The scene at the end of the film Ghost in the Shell depicts the main character integrating herself with the global network. Her personality subsumed, the assumption is that the meeting of the ‘minds’ results in a dilution, an absorption, the individual personality effectively vanishing into the uber-mind of the net. 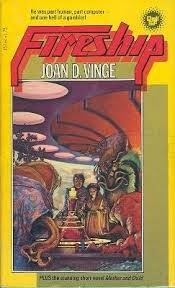 Joan D. Vinge, in her 1979 novella Fireship, takes the idea of combining personalities in a different direction: schizophrenia. Michael Yarrow is an ordinary man living on Earth, that is, until agreeing to have a jack installed in his lower spine and AI attached that interfaces with his mind. The AI named ETHANAC 500, the decision results in three personalities: Yarrow, the AI, and a combination of the two, a personality which calls itself Ethan Ring. Dominance of one over the others dynamic, the man wanders through life in a semi-spastic state as each personality pushes and pulls at control. Able to maintain the appearance of sanity, Ring commits a crime to escape his situation and lands on Mars to elude the law. Staying at the luxury casino Khorram Kabir, his singularity is all too quickly discovered. Threatened with being revealed to the police, Ring is blackmailed into helping a mysterious organization dig into the casinos’ inner workings, particularly its secretive owner. Putting his personalities to the test, what results is a suspense-filled story that threatens to tear Ring into his three different selves. In the US, the Soviet space program is given short shrift. Few Americans know the Soviets were in fact the first to put a human into orbit and return him safely to Earth, most aware only of the gleaming smiles and “One small step…” phraseology of Buzz Aldrin and Neal Armstrong. 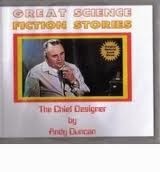 In writing his 2001 novella The Chief Designer, Andy Duncan aimed to correct this oversight. Thankfully, it was not his only goal. Opening with his imprisonment in a Soviet labor camp and ending several decades after the success of the MIR project, The Chief Designer is an abridged and semi-fictionalized biography of Sergei Korolev. Mastermind of the Soviet space program throughout the Cold War, Duncan artfully moves through the significant moments in the man’s life one window at a time. From his indirect saving of cosmonauts to his interaction with Kruschev, Brezhnev, and other Soviet prime ministers, his calm demeanor to the influence he had on later generations of engineers, Duncan captures the spirit of the man in a neatly told ‘story’. John Varley’s most endearing quality as a writer is perhaps his humanism. 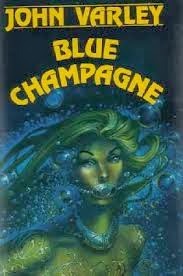 The author’s stories always keeping an eye to the manner in which various elements, most often technological or biological enhancements, affect people and society, his 1981 Blue Champagne is a great example. The novella examines disabilities, sexuality, celebrity- and voyeurism, and the manner in which technical advances could affect them all. Blue Champagne is set in a giant swimming pool in space. A low-g aquapark for the rich, amongst its inhabitants are a Baywatch-esque crew of lifeguards preying on the famous and beautiful who vacation there. Drugs and tech galore in the playground of luxury, another favorite activity is the video taping of life—many of the pool’s visitor’s in fact reality tv stars. One of the main characters is QM. A golden boy in the pool, he is a lifeguard constantly on the lookout for fast love. And he finds it in Megan Galloway, a paraplegic with a sidekick. The sidekick one of the important parts of the story, it is essentially a torso wrap which stimulates the body electrically. Bach still lacking feeling below the waist, she is nevertheless perfectly mobile. Also caught up in video taping and analyzing life with a computer, she and QM traverse the paths of love—her computer perhaps capable of capturing that exact magical moment it first blossoms. 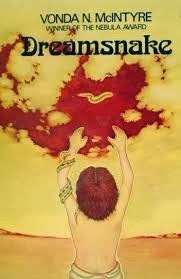 I acquired Vonda N. McIntyre’s Dreamsnake based on strong desire. Prior to purchasing the 1979 novel, I had spent a long weekend hiking in the sun. Arriving home and picking up Ben Bova’s The Best of Analog thinking to read a few pages before falling asleep, all too quickly I was caught up in McIntyre’s novelette “Of Mist, and Grass, and Sand”. And when I did read the last word—after midnight, it was with frustration. The story of Snake so effectively balancing empathy and plot, I wanted desperately to know what happened after the healing in the village. Where did her journey take her? Did she ever return from wandering the radiation scarred land? And ultimately, was she able to replace the one item an ignorant couple had all too easily deprived her of? Despite its fairy tale elements and big-button morals, Dreamsnake (1978) extends the story to novel length and answers these questions in quality fashion. “Of Mist, and Grass, and Sand” forms the opening chapters of Dreamsnake. Attending to a boy with a tumor lodged in his stomach, it tells of a night in the life of a healer named Snake. The tools of her trade non-standard to say the least, the three snakes she keeps in a basket each perform a role in the curative process. The boy frightened—but not nearly as much as his parents, he submits himself to Snake’s peculiar requests, and endures the pain she asks of him in preparation for the cure. Preparing this cure an esoteric process, the sacrifices made test everyone involved—perhaps Snake the most. But when catastrophe strikes while effecting the prepared drug, Snake is left to pick up the pieces and wonder what her future holds. Despite being on multiple bestseller lists, despite winning the Pulitzer prize, and despite being a writer of “literary training, generation, and pretensions”, Michael Chabon is a genre proponent. (Read the afterword to his 2008 The Yiddish Policemen’s Union for more info.) Literary fiction aficionados lauding Chabon’s talent—for talent it is, The New York Times Magazine, one of the bastions of American literature which lets speculative fiction play on its margins, contracted the author to write a serialized genre story. 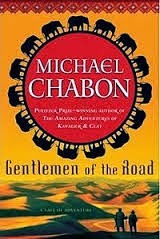 Published over the course of five months, and collected in a single volume in 2007, Gentlemen of the Road is the result. In the time honored tradition of Fafhrd and the Grey Mouser, Elric and Moonglum, and all other fantasy adventure pairs, Chabon adds Zelikman and Amram to the mix. The former a scarecrow-thin physician of Frankish descent who wields a blood-letting lance as a sword and the latter a strong-as-an-ox African who carries a Viking axe into battle, the pair get themselves into one scrum after another as they cheat, cure, assist, and fight their way across the lands of Kazaria (what is today the Caucus region) in one adventure after another. There may be no greater writer of speculative fiction shorts than Ray Bradbury, and The Illustrated Man is one of his most celebrated collections. Tied loosely around a framing device more dependent on Something Wicked This Way Comes than anything inherent to the collection, the stories plumb the depth of the human heart and emerge bittersweet. The collection opens with the narrator traveling the Wisconsin countryside by foot. His fire a beacon in the night, a man who’s just been kicked out of the circus comes to join him. Covered in tattoos, the man asks for the narrator’s hospitality before settling into the story of how he came to be unemployed. A deal with a witch gone wrong, the tattoos he asked for are not what he received: most people who see the metamorphing images end up dead shortly thereafter. The circumstances dictate his terms of employment are most often of the short variety. Curling up beside the fire, the man eventually goes to sleep, leaving the narrator to watch the illustrations come to life on his tattooed flesh. 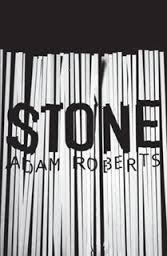 It’s been several days since finishing Adam Robert’s 2002 Stone, and I’m still unsure what to think of the novel. On one hand, it could be a semi-jumble featuring a few strong ideas wedged inexpertly into a single story. On the other, it could be something more profound: the strong ideas may prove to be something more in combination, the linkages yet to be made in my brain. Regardless, the fact I’m still mulling it over means there is something to the book. Stone is the story Ae, a convicted murderer living in a jailstar. An epistolary novel, Ae writes journal entries to a stone while living in a prison inside a sun. ‘Executed’ in the first few pages, he is rendered a mere mortal when all nanotech is removed from his body. In the universe at large, Ae has the unique distinction of being the only criminal. Nanotech evolving humanity into a utopian state, Police do not even exist. People travel from one exotic world to the next, living a dream without fear of disease, ageing, death, and even crime. It is thus that a special prison has been built to isolate Ae from the rest of society. Watched over by two jailers, a strange voice comes into Ae’s head one day offering him a deal: if he is helped to escape, will he agree to kill all 60 billion people on a planet to be named later? Agreeing to the conditions, his jailbreak is made and the story begins. Arthur C. Clarke, Isaac Asimov, and Robert Heinlein were once the ‘big three’ of science fiction. Vanguard of the Silver Age, their stories were amongst the most widely read science fiction of the time, and remain popular to this day. Influential in obvious and unobvious ways, their optimistic vision of technology and mankind in space have carried on. 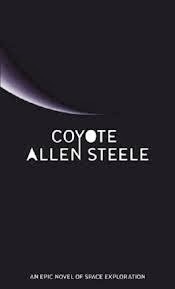 Written wholly in the spirit of these three men, Allen Steele’s Coyote series is an acknowledged confirmation of the tradition that tells its own tale of planetary adventure. The first books in the series is called simply Coyote (2002). Published (interestingly) in Asimov’s over the course of a year, the book is broken into novella/novelette sized chunks. 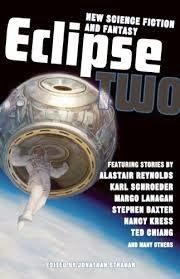 Each moving linearly into the next, the stories describe the people of the USS Alabama on their trip from Earth to 47 Ursae Majoris, a moon dubbed Coyote revolving around one of its large planets, and the beginning of their settlement. Coyote full of tricks, the story is part drama, adventure, and colonization effort, buoyed by Steele’s clean, practiced prose. Amongst myself and those I have met in my life in the West, little to none ever received any Asian history lessons. China a country which is only recently gaining attention, it is largely due to commercial and political interests that knowledge has begun to expand. Remaining lost to most Westerners is the rich history and culture which have brought China to the place it is today. Vying with with Mediterranean and Middle Eastern cultures for the earliest recorded word, its literature is also amongst the oldest in the world. Included in this is a wealth of storytelling—including works of fantasy. This is not to say the West has been ignorant of the Middle Kingdom, only that such knowledge is passed on by a limited group. Scholarly research and esoteria the norm in which knowledge of China is propagated, the fictional side has received little treatment. But that is not what makes Barry Hughart’s 1984 novel Bridge of Birds so remarkable. Fully integrating Chinese legend into ‘reality’, the sub-title of the novel spells it out: A Novel of an Ancient China that Never Was. Hughart one of those few who took the time to seek out knowledge on his own, the book exudes both the joy of storytelling, knowledge of the Middle Kingdom, and the desire to say: ‘Hey, look at this treasure trove of fictional delight just waiting on the other side of the Pacific!’. 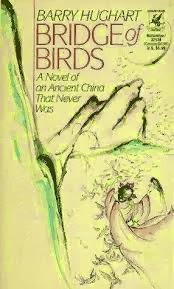 Never overt, Hughart assimilates street corner myths, novels from the Chinese canon, Chinese culture, as well as bits of Daoist, Confucian, and Buddhist philosophy into his first novel, Bridge of Birds. Having lived in China for four years, I can attest to the veracity of the spirit and wisdom of the land placed on the page. Part mystery, part adventure, part ‘historical’ fantasy, and all intelligent fun, Bridge of Birds is one of the most unique works of fantasy ever written—in the West. And... Speculiction is back. Argentina and Chile were great, but, like always, I wish we had more time to explore. One life is not enough to see this world! !